When a car rolls of the assembly line, or a widget off the production line they are pretty much exactly like the one produced before it. When an owner takes delivery of a new building, it isn’t quite the same scenario. Manufacturing processes are guided by established quality processes & personnel that ensure the products continuously meet specification. While not without quality processes, the building industry can not deliver a quality buiilding without devoting resources to focus on quality assurance. A quality assurance process takes on added importance as the complexity of the building systems and diversity of project stakeholders increase. A commissioning agent’s role is to design and manage a custom-made quality assurance process that is unique to the project, project schedule, systems operation, and the owner’s specification. A well executed commissioning process provides quality checks throughout the conceptualization, design development, construction, start-up, and hand-off phases of a building project. Additionally, it leaves the building operators with the knowledge and documentation necessary to maintain and improve the building performance. Commissioning addresses the verification of both the tangible and intangible aspects of materials, equipment, and systems and focuses on the difference between systems simply operating and achieving the intended performance parameters. Innovative Facility Solutions, Inc. can be an effective partner in helping you ensure and maintain comfortable and safe environments; ensure functional, mechanical and electrical system installations; maximize operational efficiency initially and throughout the life of your facility; and plan for your future. Invite us to improve your Building Systems @ Work. Paul C. Tseng, “Building Commissioning: Benefits and Costs,” HPAC (April, 1998), p. 52. Evan Mills, et. al. 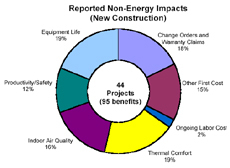 “The Cost-Effectiveness of Commercial-Buildings Commissioning,” LBNL – 56637(December, 2004).